At the most basic level, Elmer Simon was a Chippewa native American who graduated from the Carlisle Indian School on April 13th, 1896. On a deeper level, however, he was a high-achieving student with a prestigious record with the Carlisle Indian School. There is no formal record of Elmer Simon’s life or history. Instead, by piecing together newspaper excerpts from the 1890-1900’s period, we have been able to construct somewhat of a working history for this star author. Five different newspaper excerpts are mentioned throughout Elmer Simon’s biography. To avoid slowing down the reading, we have added numbered annotations into the text to reference the source. If you’d like more information on the sources or if you’d like to read the texts yourselves, match up your number to the one provided on the bottom of the page or check out the “Further Readings” page. Of Mr. Simon’s hobbies at the school, we are mainly aware of two: We know he was a prominent bass player and soloist in the Carlisle Indian School Band, performing the Carlisle Indian School March, a piece written and conducted by Native American Bandmaster Dennis Wheelock, as his featured piece . We also know that he was a prominent football player at the school . Although there was no ‘official gradebook’ or ‘letter of recognition’ to be found, Simon’s other accolades mostly speak for themselves. Mentioned as a speaker who received many compliments during a Carlisle Indian School sponsored event, Simon was highly popular with the white community that surrounded the school . Additionally, he was mentioned in a news story of a murder/suicide of another Carlisle Indian School student, added to the article to reinforce the good work the Carlisle Indian School was doing overall . 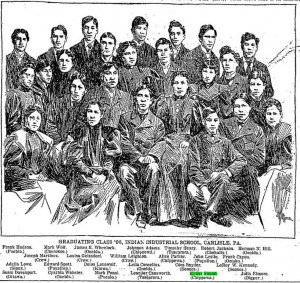 This piece in particular, subtitled “Only One In Every Fifty Indians Graduating from the Carlisle Indian School Becomes a Bad One,” praised Simon as a strong achiever within the school and a recognized graduate (The North American (1899), 4). Sources are thin on Elmer’s whereabouts after his graduation from the Carlisle Indian School in 1896. One lone newspaper article depicts his divorce from his wife, Bertha Stewart, in 1908  . He was living in Jonestown at the time and worked at Swank’s Hardware Store, and previously at Bantley’s Store in Winbur. But that is where Simon’s trail ends, as that is the last article to refer to an Elmer Simon who graduated from The Carlisle Indian School. Into the 1920-30’s, there were several additional newspapers in which the name “Elmer Simon” was mentioned, but there was no mention of the school or of the Simon in question being of Indian descent. And until more sources are found concerning the whereabouts of Elmer Simon, this story will remain incomplete. “No Tomahawk There.” Daily Inter Ocean [Chicago, Illinois] 7 Mar. 1896: 9. 19th Century U.S. Newspapers. Web. 15 May 2017. “Carlisle Indians Entertain.” North American [Philadelphia, Pennsylvania] 13 Apr. 1894: 2. 19th Century U.S. Newspapers. Web. 15 May 2017. “He Used to Be a Very Good Indian.” North American [Philadelphia, Pennsylvania] 2 Aug. 1899: 4. 19th Century U.S. Newspapers. Web. 15 May 2017. Find anything new on Elmer Simon? Post a comment down below and our team will be sure to check it out. This entry was posted in Assimilators, Chippewa, Elmer Simon, Graduation Speech, The Red Man and tagged Assimilation, Bibliography of Native American Writers, Civilized, The Red Man, white-Indian relations. Bookmark the permalink.